Aquarium Filters - Are They Essential For The Health Of Your Fish? Aquarium filters are essential to the health of your fish. Imagine for a moment, even though it might be disgusting to think of it, if you were to live in a container of your own excrement and waste food products day after day, month after month. Chances are you wouldn't last long and it would be a totally repulsive experience. Although it's a horrible scene I just depicted above, it's a good way to keep you alert to the fact that your fish live in an environment that they can't clean themselves. They really need your help to remain healthy and fully functioning and free from disease. This is where the aquarium filter comes in. There are many types of filters but you will always find one that is optimal for your tank requirements. The aquarium filter is designed to remove many types of waste from your aquarium and because fish waste and other decomposing food matter produce the chemical ammonia, it must be removed as ammonia is highly toxic to your fish. The bacterial processes of you filter will oxidize the ammonia into less toxic nitrites and then into nitrates. If you have aquarium plants these will also nullify the effect of those remaining nitrates so that your aquarium water quality is almost as good as it would be in the wild where the fish originated. If you get the filtration part of your aquarium in order this should, theoretically at least, allow you to keep more fish in your tank. This can be handy for say, an African cichlid tank where you sometimes use the "overstocking" method to reduce aggression between the fish. There are several types of filtration you could use, sometimes simultaneously in the one tank. For instance I use both a "canister filter" and an "air/sponge" filter in my large display tanks. You don't need to confuse the issue though, especially if you're a beginner hobbyist. Just stick with the main ones that are tried and tested and they will see you through. 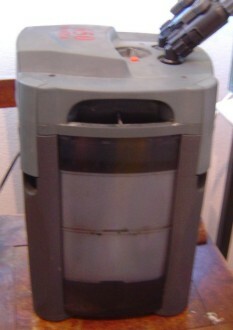 This is an example of an external filter. It does a variety of filtering jobs at the onetime i.e. Mechanical, biological and even chemical if you set it up that way. I prefer this type of canister filter than the ones you place inside the tank itself because this type of filter is outside the tank and it saves on vital tank volume. Additionally, these types of aquarium filters have more filtering material contained within them and so can filter a greater volume of water over a longer period. Contained within the canister itself can be a variety of filtering material such as charcoal (older types) and plastic ball-like particles. Also, with its ease of assembly and disassembly via stop taps and clips, you are able to clean the filter material quite easily and quickly. Just remember to wash the filter material in the water from your tank itself. That is, when you do a water change, remove water (about 1/3 of tank) into a bucket. Then use this water to wash the filter material of excess waste. If you use tap water you can wash away the vital biological elements that actually live inside the filter that have built up over time which keep your fish healthy. You could also put dangerous chemicals into the filter material like chlorine if it's added to your water supply. Most fish can not deal with this type of contamination and will go "belly-up" in a short period of time if these are introduced into their environment. Just rinse the excess sludge away from the filtering material and place it back inside the filter tray. Not only does this filter aerate the water via the bubbling but the sponge traps the excess particles that are floating around. When you see the sponge become clogged it should be cleaned, and in time, replaced. Just remember to do this cleaning in the same manner as the canister filter. You should also pick filters that are appropriate in terms of the size of your aquarium. 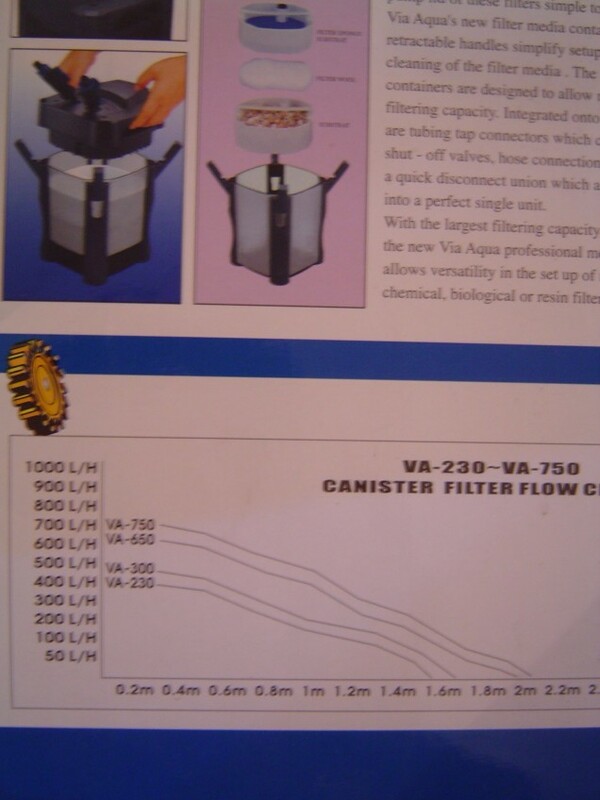 You'll see in the information on the manufacturer’s box that describes the capacity of the filter, usually in liters per hour. A general rule of thumb is for your aquarium filter to process the water in your tank approximately twice per hour. WARNING: This doesn't take into account the filter getting clogged up and slowing down so regular maintenance is important. Of course it depends on the filter load related to how many fish in your tank, and the size of it, but as a general rule I'd suggest cleaning the filter monthly. This includes the partial (1/3) water change and washing the aquarium filter material in the way as suggested above. 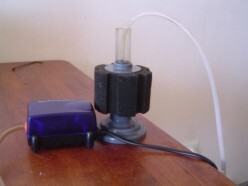 I hope this gives you a better idea of how aquarium filters are used and operated.